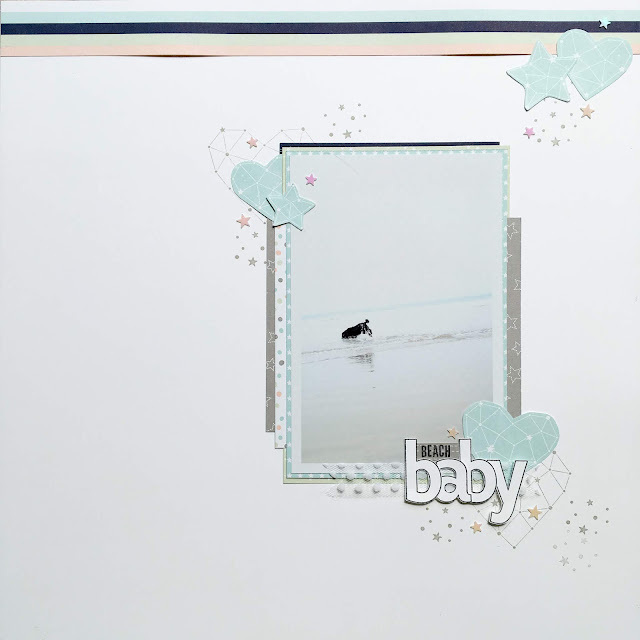 Scrapping Mojo Designs: 'Beach Baby' Scrapbook Layout using Little Twinkle from Stampin' Up! 'Beach Baby' Scrapbook Layout using Little Twinkle from Stampin' Up! I scrapped! It's been a while, I haven't been inspired recently, but then the Little Twinkle collection arrived and it was the first thing that I wanted to do! I knew I had the perfect photo to go with the soft colours so I got stuck in, and this is the result. I'm pretty pleased with it :) The photo is of Mojo (who else?!) having fun in the waves on a beach in Pembrokeshire, Wales, where we spent a week in April this year. She absolutely loved spending time on the beach and was constantly in and out of the sea. It's the first time I've used the Lined Alphabet stamp set too, and I really love it! I think it's going to be a really versatile set. Supply List: Little Twinkle, Lined Alphabet & Make A Difference Stamp Sets; Twinkle Twinkle Designer Series Paper; Whisper White Cardstock; Grey Granite & Tuxedo Black Ink; Whisper White Polka Dot Tulle Ribbon; Twinkle Adhesive Backed Sequins. August is another fabulous month for promotions! 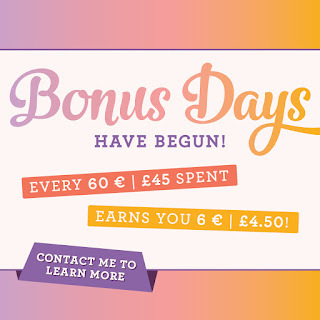 For every £45 you spend in August (before postage) you'll earn a coupon for £4.50 to spend in September - how amazing is that?! 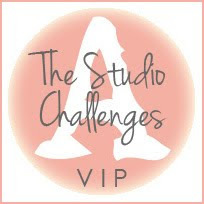 Keep an eye on my blog and facebook page throughout August as I'll be sharing ideas for projects that can be made with £45 product bundles. Stampin Up! 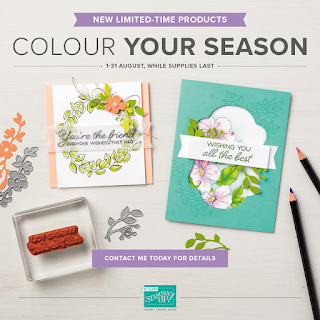 have also released a gorgeous new product suite, which will only be available during August, while stocks last. 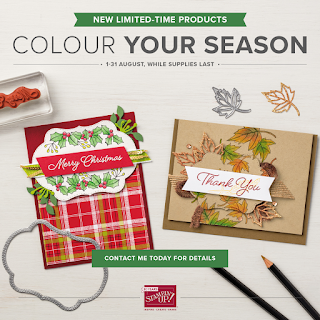 The Blended Season Stamp Set and Stitched Seasons Framelits Dies are a great set for all year round crafting, and the images are just perfect for colouring with the watercolour pencils.